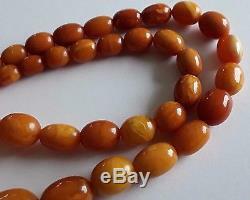 BEADS ARE HANDCRAFTED USING 100% NATURAL GENUINE BALTIC AMBER STONE. PLEASE TAKE A LOOK AT ALL THE PICTURES. 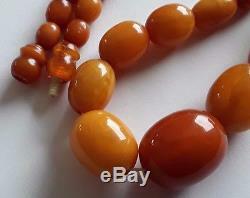 Of biggest beads 19.5 x 16 mm. Smallest beads 8 x 7 mm. Of the necklace 18.5. Of the necklace 24 gr. We honestly describe our items to the best of our knowledge. Process cannot be initiated without prior communication, notice. Do not dispose original packing, box or parcel as it is mandatory to initiate return process. If you have disposed original parcel return process is not possible. All items are delivered from Lithuania. THANK YOU FOR HAVING VIEWED THIS ITEM. It's amazing to think that a single piece of amber with a single spider in it can open up window into what was going on 50 million years ago... Is between 30 - 90 million years old. Copal is the immature resin of a tree, being only a few hundred years old to a several thousand years old. 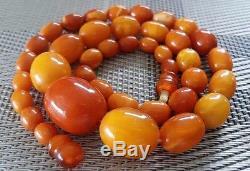 Amber is the mature fossilized resin of an extinct tree and is millions of years old. 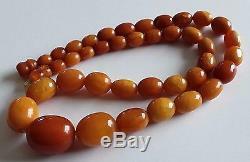 Amber is fossilized tree resin (not sap), which has been appreciatd for its color and natural beauty since Neolithic times. 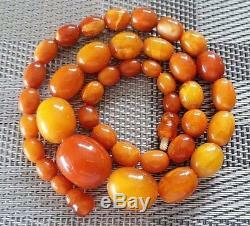 Much valued from antiquity to the present as a gemstone, amber is made into a variety of decorative objects. 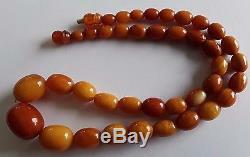 Jewelry made of Amber are thought to work effectively for minimizing pain in neck, head and throat areas. Bracelets made from this natural resin are worn mostly because they are believed to lessen pain of Arthritis, Rheumatism as well as joints. 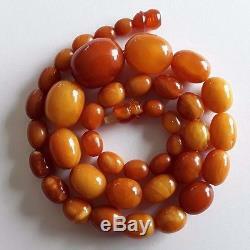 In addition to that it is also thought that wearing Amber jewelry can help to minimize anxiety and overcome fatigue. 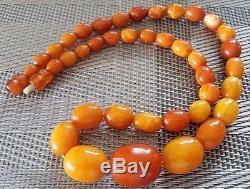 Some people also wear Amber necklace since they believe that it can help to enhance function of thyroid. If you are picking a necklace for this particular purpose it might be a good idea to choose shorter necklace, which would as close to thyroid as possible. 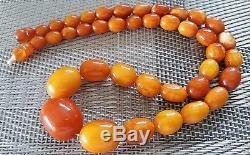 The item "Antique Vintage Rare Baltic Amber Olive 1920c Beads Necklace" is in sale since Sunday, January 6, 2019. 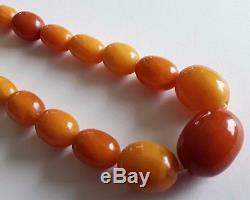 This item is in the category "Jewelry & Watches\Vintage & Antique Jewelry\Fine\Retro, Vintage 1930s-1980s\Necklaces & Pendants". The seller is "mamgis7" and is located in Vilnius. This item can be shipped worldwide.